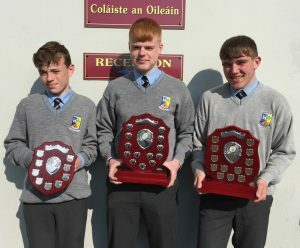 St. Patrick’s Secondary School Celebrates Football & Athletics Glory. 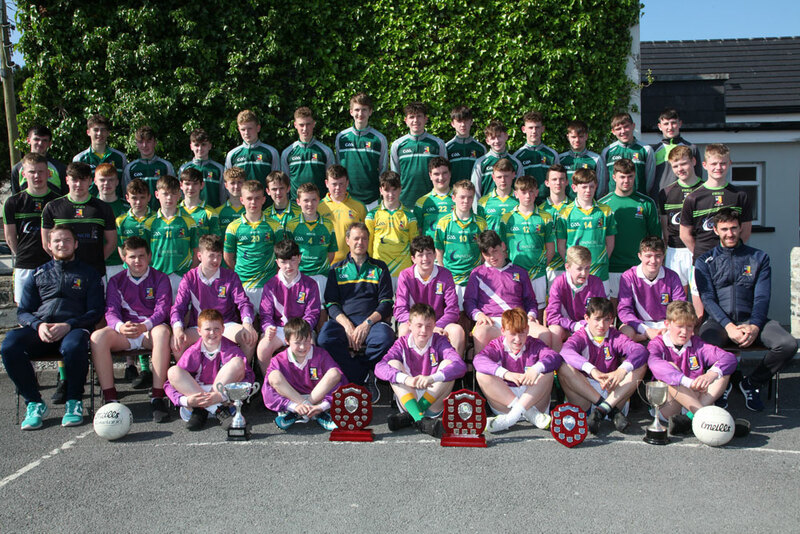 The Staff and Students’ of St. Patrick’s Secondary School, Castleisland brought a very successful 2017/2018 school year to a close celebrating their three Kerry Post Primary school football titles and five gold medals for first-year student John O’Connor in Athletics. 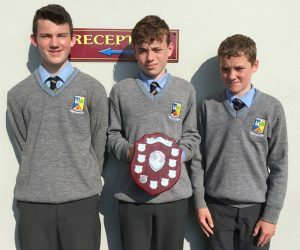 In Football the U16 ½ team captained by Garry O’Sullivan won the Joe O’Connor shield, defeating Castlegregory 4-8 to 1-7. The U15 team captained by Darragh Kelly won the Brendan O’Shea shield, defeating Coláiste Íde and Íosef from Abbeyfeale 4-8 to 0-10. 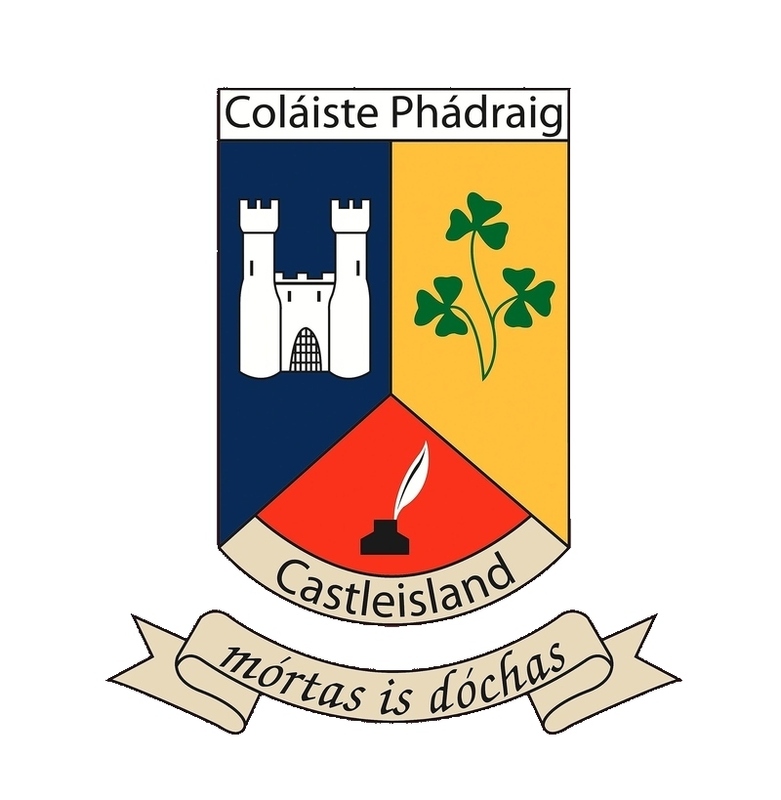 And to finish off the year a spirited team of first years captained by Luke O’Connell won the first-year league, defeating St. Michaels College, Listowel 2-19 to 1-13 after extra time. St Patrick’s Secondary School’s First year Joint Captains L to R: Raymond O’Neill, Like O’Connell, Cathal McElligott. 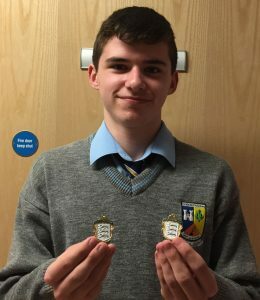 Above: John O’Connor, a first-year student of St. Patrick’s Secondary School with his two North Munster Gold medals. North Munster Indoor championships earlier this year and followed that with gold in the 100m Kerry colleges Athletics Track and field in early May. To finish off the year John won gold in the Munster school 100m on a time of 12.14 seconds. It has been a great year for John on the track in Kerry and Munster school competitions. He is a special talent and has a very bright future ahead. We look forward to John having great success in the years to come. This is a wonderful achievement for the students, their teachers and for the school. This success is well deserved as all the teams have done tremendous work preparing and training throughout the year and huge credit is due to them for the commitment they gave to training outside of school hours and during school holidays. This success is built on what this school instills in all of our students in terms of hard work, commitment, working for each other and working as a team and the belief that anything is possible when everyone works together and we encourage them to transfer this belief to their academic work. The future looks very positive for our footballers and we now look forward to building on this success as we prepare for next year’s competitions. Well done to all involved. As the school year comes to a close I wish to thank everyone that has helped and supported us during the year. Denny Porter for his huge commitment to our basketball teams, to Castleisland Desmonds GAA club, Castleisland Rugby Club, Castleisland Soccer Club, An Ríocht Health and Leisure and Castleisland Community Centre who make their facilities available to us at all times. We remember the late Georgie O’Callaghan who gave so much of his time to our soccer teams. He will be greatly missed. Front L to R: Kalum Buckley, Diarmuid Daly, Sean Keane, Redmond O’Connor, Mark O’Connor, James Kenny 2nd row L to R:Mr J Forrest, Brian McEnery, Evan Murphy, Seamus Fleming, Mr J O’Sullivan, John O’Connor, Cathal Brosnan, Eoin McSweeney, Padraig Brosnan, Mr P McCarthy. 3rd row L to R David Dillon, Peter Burke, Trevor OSullivan, Jack McElligott, Cathal McElligott, Daire Murphy, Darragh Buckley. 4th row L to R: Shane McEnery, Garry O’Sullivan, Luke O’Connell, Adam Healy, Bryan Roche, David Griffin, Conor Wilkinson, Eoghan Kenny, Paddy Brosnan, Patrick Roche, Raymond O’Neill, Matthew O’Connor, John Bell, Adam Jensen. Back L to R: Cian Ring, Shane Óg McGaley, Sean O’Sullivan, Jason Brennan, Colm Roche, John Curtin, Nathan O’Callaghan, Dylan Curtin, Adam Kelly, James Baily, Gearoid Coffey, Josh McCarthy, Darragh Kelly, Padraig Hillard.